If you’ve always wanted to be an artist, you can find iPad apps that let you do just that. 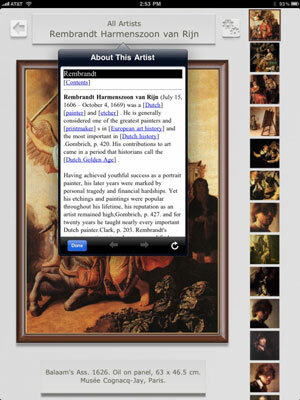 You can also use iPad apps simply to appreciate good works of art. Having Art Authority is like having the history of Western art in pictures and words on your iPad. The app includes works by hundreds of artists, organized alphabetically by artist and also by art period (called Rooms within the app). Art Authority also includes detailed information about each artist. Brushes is a drawing-and-painting app designed exclusively for the iPad. 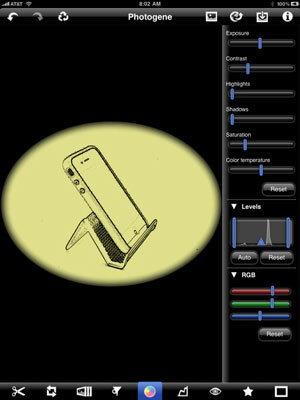 With a simple, elegant user interface, Brushes offers a powerful toolset for drawing and painting. Thoughtful touches abound in Brushes. There’s a terrific color picker, it supports up to six layers, and can handle at least ten levels of undo and redo. Color Splash focuses on doing one thing well: converting a photo to black and white, and then enabling you to colorize specific parts of it. When you open a picture in Color Splash, it’s converted to black and white automatically. It’s time to get creative and break out one of the two brushes, called Color and Gray. If you make a mistake, you can use the Gray brush to undo what you’ve done. 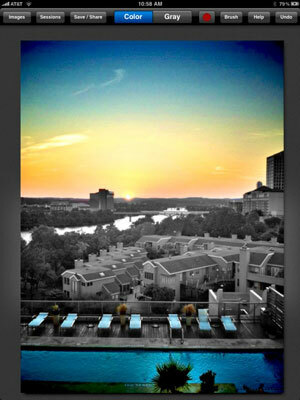 This picture shows a finished Color Splash picture, in which the Color brush reveals the colors in the sky and sunset at the top of the image and the pool and chairs at the bottom. Everything else in the picture — basically the entire middle section — remains black and white. Photogene is an image manipulation program with an exceptional and user-friendly interface. Photogene also has an extensive list of features, represented by the icons at the bottom of the screen. Unlike most similar apps, Photogene can edit high-resolution RAW files. If you use your iPad to retouch photos, you should definitely have this app in your arsenal. 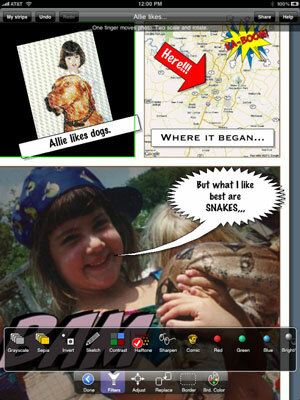 This app is fun and easy to use, and it provides numerous creative options for turning your photos into comic strips or graphic novels. You can apply any or all of the effects to any image or map in any panel of your comic. You can also add embellishments like cartoon balloons, text blocks, shapes, stickers, borders, cutouts, and more. Also, Strip Designer has export and social-media options galore, making it easy to share your strips with others via e-mail (at normal or high resolution), Facebook, Flickr, and Twitter. Adobe Photoshop Express has all the features you’d expect from an app that bears the Photoshop name — crop, rotate, flip, exposure, saturation, tint, and color–to–black-and-white conversions. It also integrates well with a Photoshop.com account. If you have one of these accounts, you can upload to and download from your online photo library and use the more advanced Photoshop.com image-editing tools for images that need more help than even Photoshop Express can provide. Many people think that this excellent, pro-quality painting-and-drawing program is every bit as useful for professional illustration as Brushes. ArtStudio has one thing Brushes doesn’t: Art Lessons. The lessons show you how to create a 3D drawing and how to draw animals, faces, and humans. They’re even kind of fun while you trace over every stroke in each lesson. This app is brought to you by Canon, but they’re not all in your face about it. The app showcases “the world’s most distinctive and provocative photographs.” It’s just a fancy photo gallery, but the photos are generally superb. And the Pro Tips that accompany them — such as “very fast shutter speed” and “shallow depth of field” — are useful if you’re the type of photographer who likes to know how to “do stuff” to make your pictures more interesting or dramatic. Reel Director is an amazing app that lets you do great things with video files. It’s hard to believe, but Reel Director lets you combine and rearrange clips; add text overlays; and add really cool opening and closing credits and title cards. It also includes 28 sweet transitions, which have animated previews and can be applied globally to an entire project. This one’s a one-trick pony, but that trick is pretty slick . . . . This app creates dramatic depth-of-field effects that look almost as good as that amazing depth of field you can only really capture with an expensive Digital SLR camera and a decent lens. To give your photo depth of field, tap the spot you want in focus. In a few seconds, your picture magically appears as if it had been shot with a very shallow depth of field. Using a great set of interactive slider controls, you can adjust the depth-of-field effect in near-real time.